Photo: Mrs. Greig and her science students are in the initial planning stages of the school vegetable garden. See the photo slide show at the bottom of the page to view their progress. Students enjoyed their day trip to the farm. Here's a clip of the students and some of the activities they participated in. Chef Sean Brock talks to the Trident Middle School students about organic farming and sustainability. Our garden has been planted, harvested, and consumed! 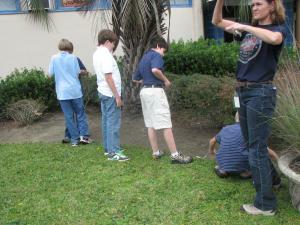 Mrs. Greig's middle school science students are starting to build a winter vegetable garden in the courtyard. Our special thanks to Dr. Jenkins. He acquired and delivered to us all of the edging for the garden. He also provided us with his gardening expertise. Keep an eye out in the courtyard for fresh lettuce and carrots, amongst other things! What better way to get inspired than to visit an organic garden with the Executive Chef of Charleston's popular McCrady's Restaurant? Thornhill Farm in McClellanville to see organic gardening first hand.